In 1952, the little boy Ignazio Iacono, barely nine years old, started to work at “Antico Caffè Orientale”, among the most prestigious pastry shops in Modica, gold medal winner in 1915. In that bakery, between flour, eggs and sugar, the little boy learned the pastry art, its technique and its secrets with a lot of passion that lasts until today accompanied by an aesthetic taste. He was remained faithful to the Sicilian traditional pastries and in particular to the pastries of Modica (Chocolate of Modica, mpanatigghi, nucatoli, cannoli with ricotta, almond biscuits, cubaita, granite, etc. ), finding the right balance between past and future. In 1962, he inaugurated his first pastry shop, “la Madonnina”, located in Via Vittorio Veneto. After 5 years, in 1967, he moved between Corso Umberto I and Via Grimaldi, in one of the most picturesque corner of the city. 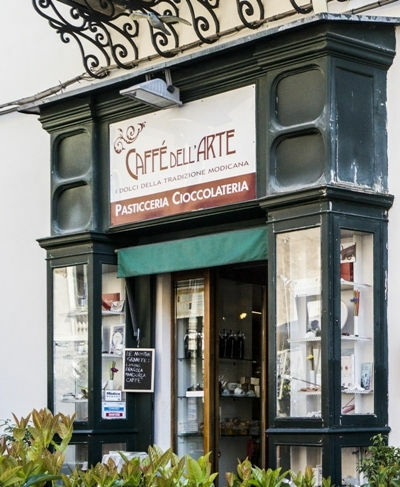 There, “Caffè dell’Arte” was born, and Mr. Ignazio, with his wife and his sons Daniele, Aurelio and Giulia, has continued, for 45 years, to delight his customers with his pastries, thanks to his passion and to his care for his work.